Transparency Market Research announced that it has published a new study based on the title “Seed Treatment Market - Global Industry Analysis, Size, Share, Growth and Forecast, 2012 - 2018.” The report analyzes estimates and forecasts the global market of seed treatment in terms of revenue. According to the studies in this report, the global seed treatment market was valued at US$2.43 billion in 2011. However, for the forecast period, 2012 to 2018, the market is growing at a CAGR of 9.2% and is expected to reach US$4.45 billion by 2018. This study report analyzes some of the major driving and restraining factors for the market and also includes various industry opportunities for the seed treatment market anticipated for the near future. The growing seed market worldwide is the major key driver for the high growth observed in the seed treatment market. In the recent years, the global seed market has been experiencing increasing development due to the technological advancements and growing population across the globe. In addition, other multiple growth factors such as the increasing technological developments in the seed treatment methods, growing focus of the seed industry on crop protection, and higher prices of seeds are leading to significant growth and expansion in the demand for seed treatment market across various geographic regions. Moreover, growth and demand of global seed treatment market is also primarily driven by the growth of the commercial seeds (conventional and bio-seeds) market. Rising technological developments in the field of agriculture and increasing input cost of seeds are expected to drive the demand for seed treatment techniques in the coming years. Also, increasing global farming activities on croplands has generated the need for high yield productivity, in turn propelling growth into the market for seed treatment. However, on the contrary, the growing government restrictions on the use of pesticides on crops and environmental hazards due to the chemicals used in pesticides may hamper the growth of the global seed treatment market in the future. Market studies included in the report fairly segments the overall seed treatment market on the basis of crop type and treatment type. It also analyzes the demand for each of these segments from 2011 to 2018. Pesticides are normally classified into fungicides, herbicides, and insecticides. However, seeds are coated with insecticides, fungicides, or a combination of these chemicals in order to disinfect the crops from soil borne insects or pathogenic organisms. In 2011, insecticides dominated the global seed treatment market and accounted for 52.5% of the total market revenue in the same year. Subsequent to the insecticides market segment, the fungicides segment accounted for 34.9% of the total market in 2011. Also, the non-chemical treatment (treatments using biological agents) is expected to demonstrate the highest growth rate due to increasing demand for bio-based seed treatment and rising environmental concerns. The nonchemical treatment sector is expected to be the fastest growing segment growing at an estimated CAGR of 9.9% from 2012 to 2018. Nevertheless, presently, the global bio-based seed treatment market is in its infant stages but is expected to witness significant growth rate over the forecast period. The seed treatment market refers to the application of biological active ingredients or chemicals to the seeds which are normally done before seed packaging. This market is high in demand because the seed treatment method is more cost efficient and effective than spraying of pesticides directly on the crops or plants. 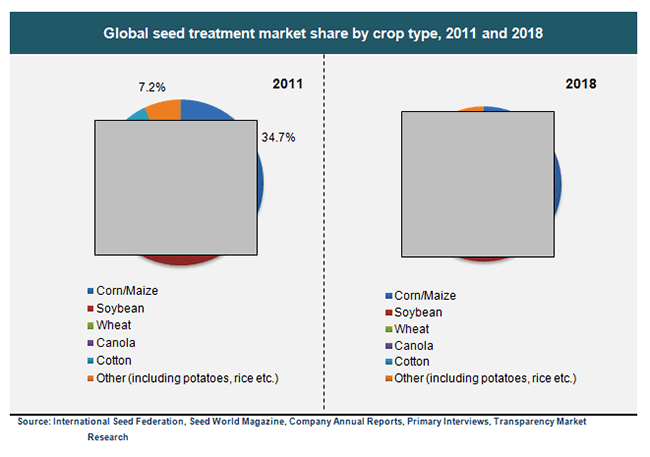 By geography, North America was the leading market in seed treatment in 2011. It accounted for 42.8% of the global market share, followed by Latin America that accounted for 24.2% of the global market in the same year. Moreover, the global seed treatment market in Asia-Pacific is growing at a CAGR of 10.2% from 2012 to 2018. Countries like China and India are expected to ingrain high demands for seed treatment market in Asia-Pacific by 2018.